Jul. 11, 2013 8:00 p.m.
“A huge thank you goes out to our community and to every funder, every volunteer and all our supportive families, and every person who accessed our services. It has been an honour to serve at the Wetaskiwin RCMP Detachment for the last 16 years. I know our new Executive Director Petra Pfeiffer, will be a huge success in our community. She has many years of experience in this field and I invite you to join me in warmly welcoming Petra.” These are the words spoken by Jeannie Blakely, retiring Executive Director, Wetaskiwin and District Victim Services. Invariably when there is a crime, there is a victim. A little over 16 years ago there was no specific agency for victims of a crime or tragedy to-turn-to. 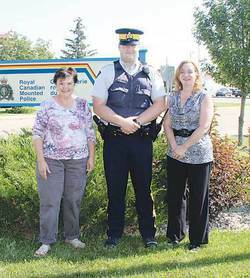 That is when the Wetaskiwin and District Victim Services Society was formed in and in partnership with the Wetaskiwin Municipal RCMP and Rural RCMP a new service was available to residents of the City of Wetaskiwin, County of Wetaskiwin up to Battle Lake, Town of Millet, and the summer villages on the south side of Pigeon Lake. Jeannie was selected as the Executive Director and from that humble beginning has evolved into one of the most respected Victim Services agencies in the province. Replacing Blakely is Petra Pfeiffer, who comes well equipped to fill the large shoes left by Jeannie. Petra previously worked for Battle River Victim Assistance Society Victim Service Units Wainwright, Vermilion, Kitscoty and Provost as the Program Director from 2006 to 2013. She was also responsible for the Regional Critical Incident Stress Management (CISM) Crisis Team for that area in that time and has led numerous debriefings and defusings specializing in providing these services to emergency personnel. “Our program started in July 1997 and since then we have opened 11,000 new client files. It is the RCMP who ensure these files are referred to our unit. While the RCMP members are continuing with their investigation, we are able to provide support for victims of crime and tragedy. We are very fortunate to have such strong support from the Wetaskiwin RCMP; Without it, we would not even be here. Victim Services Board of Directors is unique because of the high level of responsibility they have to the government and the community. I am so grateful for the leadership and support of our Board; it has many times been high-lighted as one of the best in this province. Our volunteer advocates are truly the cream of the crop of volunteers. We would be hard pressed to find any other volunteer role with the high level of training, huge expectations, the professionalism, or the depths of caring and compassion that is required of them. My hat is off to all our past and present advocates for the extraordinary work they do. We also have three staff members who are dedicated, who understand the intricacies of providing support for the people who have been victimized and the people, our volunteers, who help them. Thank you to each one of you for your expertise and years of services. Our Unit provided training for new advocates for many years. We had approximately 600 registrants from across the province coming to Wetaskiwin. Since 2011 this huge task has been gratefully taken over the by Alberta Government. A high-light of our Unit was that we were successful in applying for funding to develop a Family Violence Unit, as well as a Family Violence Community Outreach Team. It is a well-known fact that family violence is prevalent in Wetaskiwin and our goal is to make a difference. • Victim Impact Statements, Financial Benefits forms, Restitution application, etc. Other practical services are also available. Some examples might include assistance to call family or friends, emergency transportation, shelter, food, information on what is happening and what will happen next, medical assistance, safety planning, referral to other sources of immediate assistance, temporary child care, home security check. For more information, or to volunteer for Victim Services, phone (780) 312-7287 or visit them in the RCMP building Wetaskiwin.